On a cloud service, you can create a small local storage where you can save temporary files, yes I said temporary, because a local storage would not be guaranteed to be durable, for durable storage in Azure you should consider Azure SQL Database or Azure Storage (blob and tables). This reserved space could be useful to store custom error log files (nlog, log4net, …), for those files that are dynamically created by the application and you would like to cache it somewhere, and also for structured data files like database(sql ce, sqlite, …), but remember, just for volatile data. 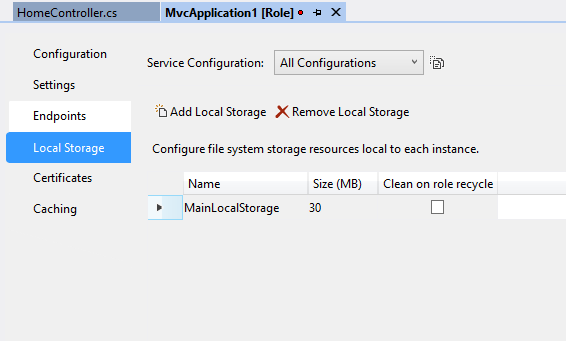 Open the Properties of the Web Role under the Cloud Service Project, go to Local Storage section, and click on “Add Local Storage”, name the storage, give a size, and save.